Spending so much time by myself in a deserted floor of a prison has made me think about the atmospheric qualities of such places and how they impact on us (and those who inhabited the prison before us). Since last week I have been working on a relatively isolated area of the prison – with little noise from guided tours and no easy access to the rest of the building. I decided to explore down a spiral staircase and found the above bit of graffiti. To provide some context, this was also a day that the weather had been particularly turbulent (for May! ): there had been little sunlight coming through the high prison windows and lots of noise caused by the wind rushing through the rafters. So far so creepy! It made me think about how the places we work in and how they can impact on us. How the remnants of the past – that seem to seep from the dusty floors, ruined walls, whistling wind and array of graffiti – and how they impact on our relationship and assessment of the places where we are working. Spending so much time in an historic prison that has such a strong link to much of Ireland’s recent social and political (as well as military) history has made me think about what Michael Mayerfeld Bell calls ‘the ghosts of place.’ In his 1997 paper he is not speaking of ‘ghosts’ per se but rather the impact of resonances of places and our connections – or lack of them – to them and how this impacts on the ‘human experience of place’. Afterall we are not robots, we feel strong emotional connections to some places, mild interest and even distaste towards others. But does this impact on how we explore them? How we study them? How we try to understand them? But there is another way of thinking about our connections as researchers to place … how might these feelings we have link to long departed people’s experiences of place? 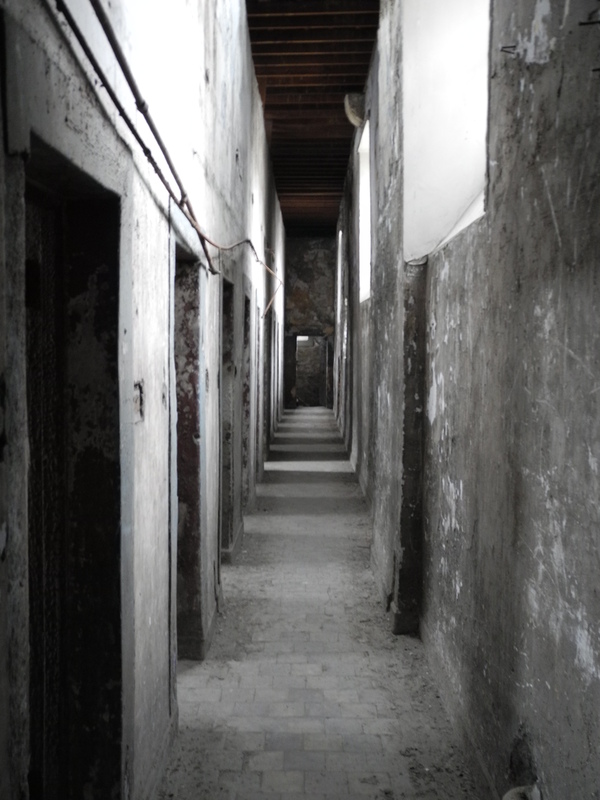 How did the connections of those prisoners who lived on this site – especially those political prisoners in the latter years of use – understand it as an already historic place and how did this frame their experiences of place? Did their palpable, material connections to previous political prisoners and insurrections shape how they felt about the prison and how they interacted with it? One way of examining this is through exploring the graffiti that remains behind. From the top floor of the West Wing (which is relatively untouched by more recent intrusions) there is a huge collection of political graffiti relating not only to the contemporary politics of the prisoners but also what they perceived as their historical precedent. There are profile portraits of 19th century characters alongside the proclamations of ‘Up DeValera’ (many of the latter showing evidence of being sabotaged at later revisits in the 1930s when the prison was derelict). 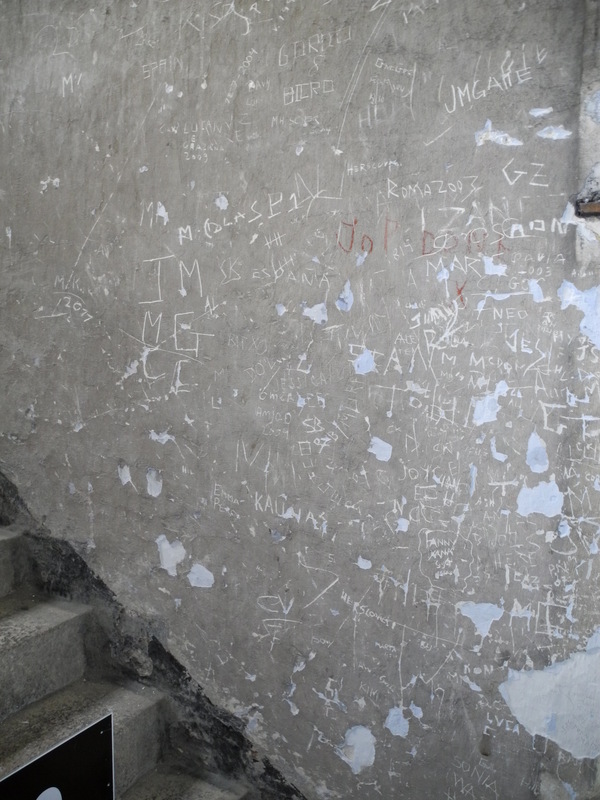 These graffiti interactions reveal not only the immediate concerns of the prisoners but their intimate connection to the carceral environment, what it signified and how ‘the ghosts of place’ acted on them. Gendered Graffiti: is female graffiti different from male? Before I started ‘graffiti hunting’ in Kilmainham Gaol I spent some time looking at other materials relating to the prisoners that were held in the prison archive. Of particular interest to me was a collection of autograph books that had belonged to female prisoners who were held in the gaol (and other holding centres) during the Civil War. Autograph books were popularly used to document the signatures, reminiscences, verses, images and innumerable types of documentary communications by the women and I thought these would make an interesting source in tryng to guess what text I might find (or not!) on the walls in the jail. One thing that I found that i hadn’t expected was the role these books played in commemorating the particular lineage of Irish nationalism that these women continued to link to, especially as manifest in the ‘blood sacrifice’ of the 1916 Easter Rising (which at the time of the women’s imprisonment was only 7 years before). As Ann Dolan has highlighted in her thoroughly researched book on commemoration of the Irish Civil War, in the early years after 1916 the commemorations were generally organised and attended by women. To appear at such public events was too dangerous and foolhardy for ‘men-on-the-run’ and women were considered less likely to be arrested and detained as a result of these ceremonies. Unusually, in the year 1923 – during the civil war – the women held in Kilmainham Gaol performed the ‘official’ commemorative duties for that year. Within a number of autograph books there are commemorative mementos detailing the form and structure of the commemorations. I was surprised to find that the focus of their ceremonies were the ‘great men’ who had been held in that prison and executed in the stone breaker’s yard (that they mainly mentioned in their autograph books as the backdrop to games of rounders!). The importance of these men was further enhanced by the elevated role that women who were related to them (and were imprisoned in 1923) held in this ceremony. Effectively, the women were commemorating the male story of the Rising, not their own. So how does this link to graffiti? So far I have recorded the majority of the top corridor of the West Wing in Kilmainham Gaol. This is the part of the prison that we know the women occupied during the (relatively) long periods of imprisonment during the Civil war so this is where I expected to see the most evidence of ‘female’ graffiti. However, the disparity between the quantities of identifiably ‘male’ and ‘female’ graffiti has become increasingly noticeable. Of course, to call any graffiti ‘male’ or ‘female’ is problematic, so I have been very strict in how I ascribe these characteristics and have only included graffiti as definitely ‘male’ and ‘female’ if it takes the form of, or is accompanied by, a signature. In my experiences so far it is clear that there is a far larger concentrations of male signatures than female, they are located across more locations and they are (often) larger in size. Female graffiti is generally grouped together, I am guessing as a communal statement of belonging. 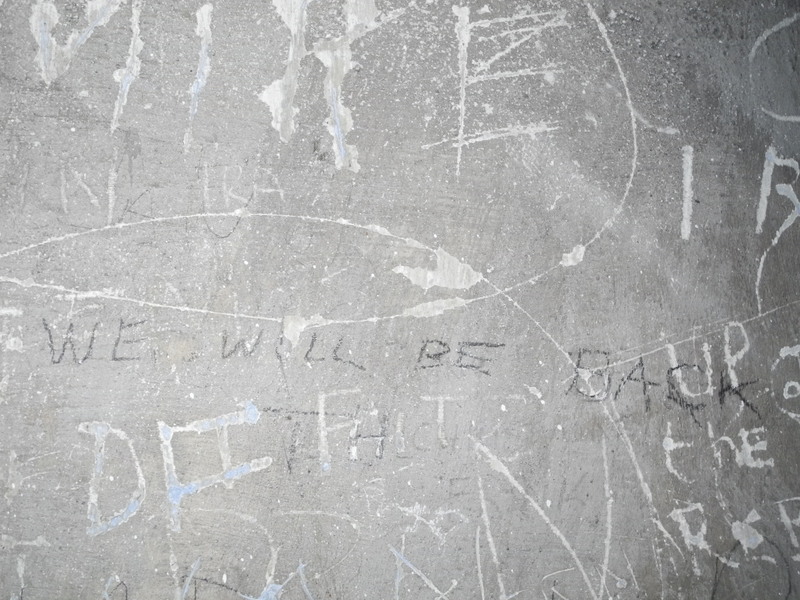 Furthermore, the majority of the very visible female graffiti was not written during periods of imprisonment but very clearly is marked as having been created on specific visits back to the site (particularly in 1938 – the prison closed in 1924). The size is generally small and there are details included that i have not noted with any male graffiti. In particular, in a number of cases the women identify the exact day, location and even arresting officer (in one case!) of their circumstances of being imprisoned. They are less ‘showy’ in their named graffiti – although we know that some of the more elaborate and artistic graffiti that is unnamed was created by women (mainly through references in memoirs and autograph books). These disparities leave big questions – Why are the women not leaving their mark in the same quantity and scale as the men? Are they instead making their mark in anonymous scrawls and drawings? Are they contributing tiny etchings? Why are there only small numbers of communal statements? At these early stages there are many hypotheses: are the women continuing to revere the men who were held there before them by leaving the walls (relatively) untouched (some of which have left still evident traces, despite the whitewashing!)? Do they want to hide behind anonymity? Perhaps they want to leave their material legacies in books rather than on walls? Or possibly they are continuing the commemorative tradition or celebrating ‘great men’ and inadvertently silencing their narratives of the period? Until the study is finished these ideas can only be conjecture but they do seem to point to a startling (if incomplete) conclusion that in this place and at this time men and women were interacting with the walls (or not) in different ways. Today was a transitional day – I moved from the ‘newer’ (relatively speaking!) part of the West Wing, which was constructed just after the Great Famine in the mid to late 1840s – to the older corridor that lies perpendicular to where i have previously been working (and interestingly is accessed via a rough cut ‘door’ through one of the ‘newer’ cells!). The cells on this corridor are in some ways more difficult and in others easier to access and record. I’ve certainly had to spend alot of time thinking about how I am lighting and photographing the walls! They are much narrower than the cells I have been recording up to now at only 1.6m wide (and 3.7m long). It is really difficult to get overview photographs of the walls because of the width but also as this part of the West Wing was most impacted by the dereliction of the prison on closure in 1924. As there was no roof for some time, there are no floor boards so I am essentially setting up and moving around on uneven rumble. This creates its own challenges as regards my lighting! The tripod stand has spent much of the day precariously hoovering – seemingly on the verge on ‘timber!’ – and the room is so small I don’t really have room for the two lights. There are some advantages – the ‘new’ roof (which was replaced by volunteers in the early 1960s) is much higher – looking up straight into the rafters – than the previous roof and therefore the cells feel much less oppressively contained. There is even a skylight (in a few days no lighting needed!) over some of the cells in the middle of the corridor. The rooms are so narrow it is difficult to get space to record large slogans or images, you have to wonder how prisoners (and they were plural!) were able to negotiate these spaces – and each other! There is a wooden bracket around 3m above the ground that is consistently located in each cell and we have wondered what it was for? There have been suggestions that possibly it was used to secure triple bunked beds to the wall. It is hard to imagine how three people could live in these cells but from the graffiti (and documentary sources) there was certainly more than one and often three! I have been spending the majority of my working week in Kilmainham Gaol for the past three weeks – slowly going blind, destroying my lungs and getting INCREDIBLY excited about the forms, types and range of graffiti that I am finding on the gaol walls. I began my search on the top floor of the West Wing (which is closed to the public and – for those who have visited – is directly above the ‘1916 corridor’). I have been using a fairly bog standard camera, a stand and two mobile lights to be able to light the rooms and allow me to better locate the often faint and partial graffiti. The first three days i was in the gaol I did not have the lighting equipment as there is no electricity on the top floor and I had to arrange for cables and lights to be purchased (and a BIG thanks to UCD AV for letting me have lights for the course of my fieldwork!) and it is AMAZING the amount of graffiti that the naked eye will miss in such dark, dirty and decayed rooms. I have found many bits of graffiti that i expected to find – signatures, political poems/verses/text, geographical locations and gaelic phrases but I have found SO much that I didn’t expect to find – shopping lists, lists of numbers (what were they for? 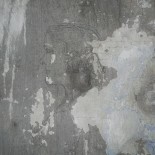 ), calendars, portraits (often side profiles), caricatures, celtic images, images of imprisonment. Almost every wall has revealed a ‘surprise’! So much to think about when spending all these hours ‘in gaol’, by myself, searching for the remnants of long forgotten material interactions between prisoner and wall. How much has the prison deteriorated? Were the rooms quite so dark / cold / drab? Where they clean or covered in dust, bird excrement and who knows what else! as they are now? How did these conditions impact on their health – both mental and physical? Can these scraps on the wall provide insights into prisoner experiences of place? Here’s hoping! Eamon DeValera? Joseph Plunkett? or just a random portrait?